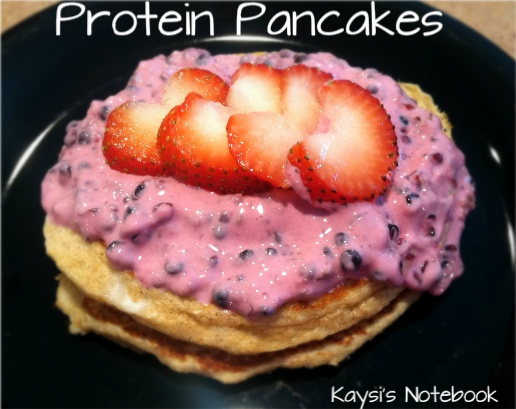 Kaysi's Notebook: Protein Pancakes - Tasty Tuesday! Protein Pancakes - Tasty Tuesday! Eating healthy doesn’t mean you have to give up ALL your favorite things. There are so many great ways to make healthy alternatives to your favorite meals. I looove breakfast food, it’s sooo yummy, so here’s a protein pancake recipe that I can honestly say I like so much more than regular pancakes. I’ve already made these 3 days in a row! And apparently they smell good to dogs because,... my dog never does ANYTHING bad but when I got home yesterday, there was a torn up zip lock back in the hallway and no more protein pancakes! Hmph! I can’t really blame him though, they’re good! ENJOY! A couple spoons full of Plain Greek Yogurt mixed with a small handful of Fresh Blackberries (which I mushed up a little with my spoon while mixing), then topped with cut strawberries. Warmed up peanut butter topped with strawberries is the other photo. They’re even good after being stored in a zip lock bag, with no topping (just don’t let your dog get a hold of it ;). Great protein packed finger food for on the go! Combine dry ingredients. Add wet ingredients and mix well. 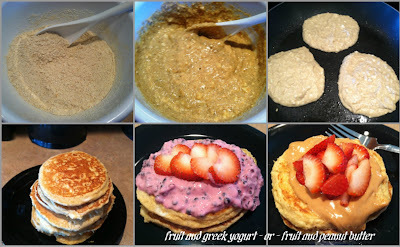 Cook like normal pancakes, in a sprayed pan, on medium to low heat. These don’t bubble like regular pancakes so be careful not to overcook. For my stove, they take about a minute to a minute and a half on each side. This recipe makes about 8 pancakes, depending on the size.